Around 2006, we were operating at a local maximum; 2007 was the big disruption. If you look back at Radio Sunpig for 2006 and 2007, you can infer some of this from the music I was listening to. 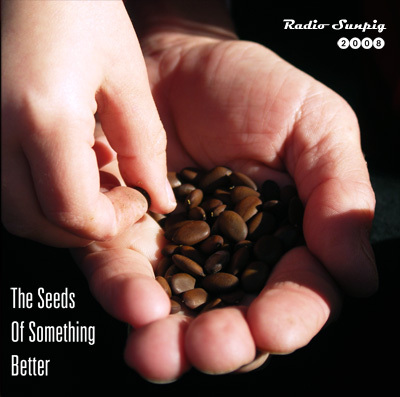 In 2006, I was featuring songs like See The World by Gomez and Use It by the New Pornographers. 2007 was much darker, with harder riffs, melancholy chords, and a significant dose of Malcolm Middleton. 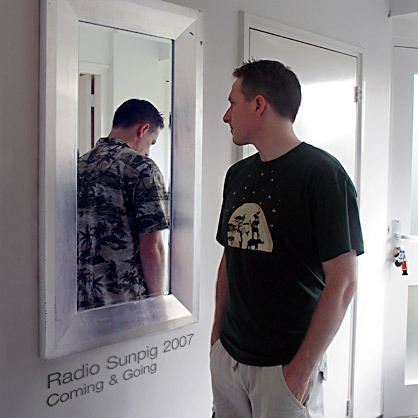 The cover I made for Radio Sunpig 2007 captures a lot of my state of mind for the year: not so good. 2008 was still not great, but at least it showed promise. Hence the title for Radio Sunpig 2008. As for the fact that I’m posting this at the end of August 2009, well. I did actually put the compilation together in December 2008 — it has just taken me some time to write about it. I first came across the Bird And The Bee by watching Dennis Liu’s delightfully playful video for Again & Again. The official video does a better job of capturing the 60s retro tropicalia vibe that suffuses the song, but nonetheless I will always think “Mac” whenever I hear it. Another slice of electro pop with tropicalia influences. The smooth 10cc-ish harmonies and keyboards give the song a laid-back background, while the drums and vocal exhortations to jump in the pool drive it forward. It shouts “summer!” — but in a cool and understated way. Los Campesinos! – Death To Los Campesinos! Jangly power-pop chaos! Rainbows! Unicorns! Kittens! Simply awesome. I came across Mates Of State via The Yellow Stereo. They’re a husband and wife duo, and here they sing about a marriage that is not going so well. The insistent kick/hat drum beat and simple piano line walk the song forward at a brisk pace, while a glockenspiel drops tiny tinkles of sad tears along the way. Kori and Jason alternate vocals, playing the parts of the couple in question, dealing with the life they feel trapped in. Upbeat and poignant. Not my favourite track from their album Ga Ga Ga Ga Ga (that would be the hauntingly sparse The Ghost of you Lingers, but the one that fits best here in this mix. This is comfortably mature indie rock – practiced, but not worn. The first Ladyhawke song I heard was the thumping Magic, which comes at you like a dancefloor zombie, relentless and hungry for synth. Paris Is Burning is a lighter track, but still bursting with shimmering disco flavour. A roiling song full of bitter lovesick emotion and heartfelt vocals, harmonizing and clambering over each other. I found Deastro’s album Keepers as a special exclusive on eMusic. 2008 was a bit of an electro-rock year for me, and I was blown away by it. Light Powered in particular sounds like a mad experiment from the BBC Radiophonic Workshop. It would not be out of place as as the title music for a bizarre 70s BBC science fiction adventure, filled with classically trained Shakespearean actors, well-intentioned special effects, and lots of Welsh quarries. You’re not going to have heard of this, but it’s great. It won the Best Song award in the Americana category of the 7th annual Independent Music Awards. It’s a 3 1/2 minute slice of peppy fiddles, guitars and accordions that sounds like it belongs in a Pixar film. In fact, the track sounded so familiar to me even on first listen that I was convinced it must have been used in the credits for one of their animated features…but no. while living in Norway” If anything sums up Radio Sunpig 2008, this is it. Crazy sweet electro pop, with spot-on lyrics. Just a perfect simple indie pop song built up from a few simple drums and guitar layers, full of easy fills and hooks. The video has a great sense of fun that perfectly matches the track. The common theme of MASSIVE POWER-POP SOUND is apparent here again. I loved this song from the first time I heard it. Fyfe Dangerfield’s shouty vocals are backed by a subtle but insistent drum groove that keeps up the pressure from the opening to the fade. This is the Futureheads in all-out rock mode. Great fun. Guitars, pounding drums, sweet Beach Boys harmonies, full of infectious energy. If this doesn’t put a spring in your step, nothing will. This is a glorious sweeping finale for 2008. Sudden love revealed. The shock of remembering that beauty exists. Eyes wide open to the potential of the road ahead. I’m allergic to cats, dogs, and pretty much anything with fur or feathers. I’m uncomfortable about the idea of getting emotionally attached to a creature that is likely to die before me. When I’m lost in thought, I’m very easily startled (to the point of jumping and shrieking) when someone approaches me unexpectedly. How would I react to a cat slinking around quietly? The kids are finally old enough that I don’t have to run around after them cleaning up their pee, poo, and barf all the time. I have no desire to start doing that again, with the added bonus features of hairballs and dead mice. I don’t want to set a pet precendent, because sooner or later the kids will want a puppy, and there’s no way I am getting up every morning at 7 to walk a dog when they get bored of actually taking care of it. Nonetheless, I do actually like cats, and I find myself in the awkward position of getting attached to the one that has made his home in our back garden. We found him mewing pitifully in one of our plant beds on 22nd July. His left foreleg had got stuck stuck through his collar, and he was walking with an awkward limp. He was extremely thin, and very skittish. We fed him some tuna, and put a cushion in the garden shed, so he would have some place to shelter from the rain. He has been with us ever since. 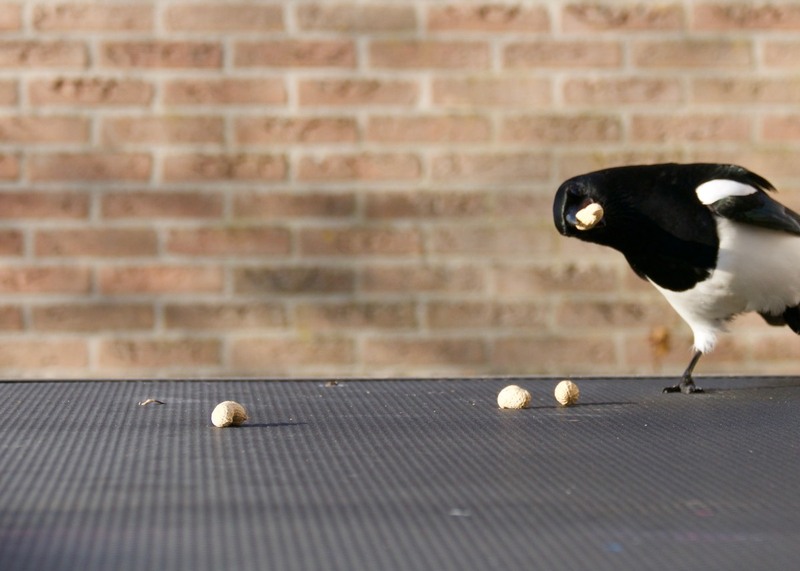 Our first theory was that his owners had gone off on holiday, and their feeding arrangements hadn’t worked out. Perhaps the cat flap had got jammed shut, or the person they had asked to feed the cat while they were away had forgotten about it. We have been feeding him twice a day, but trying not to make him feel too welcome, in the hope that eventually he’ll give up on us and return to his owners. That’s…not really working out so far. So now we bring out the heavy artillery: posters. 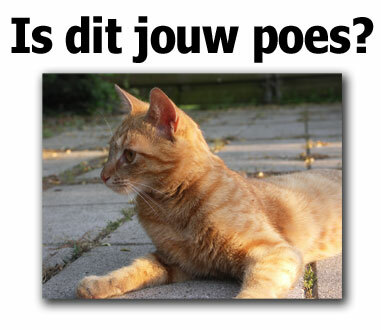 I’m going to put some up around the neighbourhood to see if anyone recognizes him and wants him back. He has a small wound on his left hind leg, and it looks like the fur there has been shaved, so it’s possible he has had an operation recently. Next week I’ll take him to the vet and see if the vet recognizes him. Ideally, someone will claim him, and the decision about what to do with him will be out of my hands. I’m looking forward to missing him when he’s gone.